Abu Anan lives in a difficult neighbourhood, sandwiched between the settlement of Givat Ha’avot and Kiryat Arba, and overlooked by a police station. He’s been jailed three times for short periods on charges he denies but is not deterred from remaining in place. We had come to help Abu Anan harvest the grain crop on his terraced field, with which he would feed his goats. No sooner had we made our way on to the field than the military welcoming party arrived, brandishing a “closed military zone” order which somehow drew a red line that excluded most of the area where harvesting was still to be done. The officer’s interpretation of the map would have meant that we could have worked on only a fraction of the field. He couldn’t explain why we were not allowed in the zone but the settlers are, other than that he believed (incorrectly) he has the authority to decide who the order applies to and where. When we questioned him further, he just said “the discussion is over,” and at one point referred us to his regiment’s (Yehuda) spokesperson, but couldn’t give us their number. 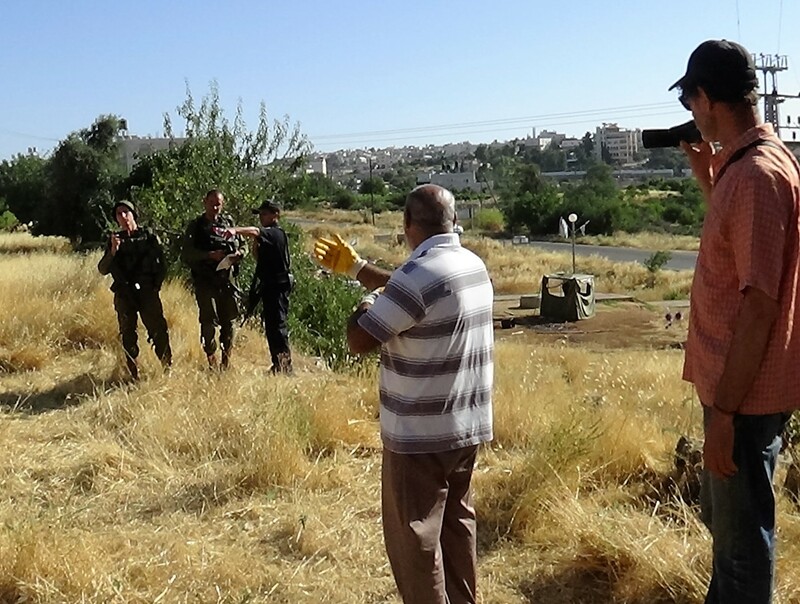 A policeman also came to the scene and tried to come to an agreement with Abu Anan himself, but the latter kept saying that he wanted to work the whole length of the field. We agreed for the time being to work within the permitted zone – vaguely delineated from a white building at the top of the hill to a tree near the bottom – until the “makat” (an officer who is supposed to coordinate civil and military affairs) turned up to negotiate. He never did. We were doing what we could in the permitted space when the real reasons for the military closure appeared. 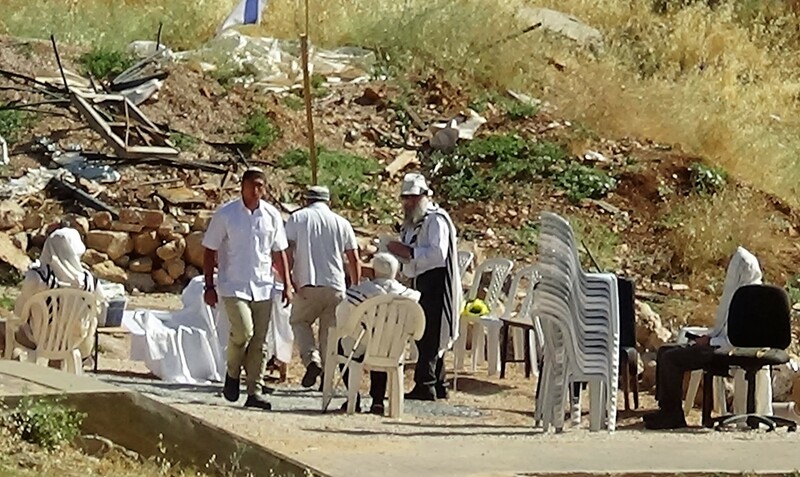 We shifted to the main road to watch the procession of settlers set up their mobile synagogue on the path, dressed in their clean shabbat clothes and the men wrapped in their prayer shawls. It seemed like an odd place to pray, but the prayer is politicized, less an expression of heavenly spirit and more a reflection of the sense of superiority, guaranteed by the guns carried by the soldiers and policemen, that is entailed in holding the prayer there. After a while we resumed our work, focusing on a corner of the field that was outside the zone and still had enough left to harvest. It extended to the road at the bottom of the hill and took us close to the forbidden path, where one of the settler canopies stood. There were a few comments shouted from their side, but for the most the settlers preferred to dialogue on friendly terms with the soldiers and police, until they eventually moved on. We were working with our hands (fortunately wearing gloves) as agricultural tools are considered a threat. We tore the chaff along with the grain from the earth as fodder for the goats. The harvested piles were packed into bale bags and hauled up the hill to the pen. That part of the field was cleared, other than thorns that not even the goats would eat and some trash by the side of the road. Yet a small strip of the crop remained alongside the path. As we got closer to the path, we were also close to the red line on the map of the closed zone order, now guarded by a few remaining soldiers, at whose feet we found ourselves working. We had to leave the last few sheaves behind and between their boots, as if for the gleaners. Last week was the Jewish harvest festival of Shavuot, at which time the Book of Ruth is read. Ruth, who was not Jewish, was a gleaner, providing also for her widowed Jewish mother-in-law Naomi. So the Biblical commandments and rabbinical teachings about leaving gleanings for the poor, orphans, widows and strangers should have been in the minds of the religious settlers and soldiers. In close up, in that section of the field, we were leaving the gleanings. But in a broader perspective, and with regard to the Biblical simplicity of our work with our hands, gathering bundles in our arms, we were the gleaners confined to a corner of the field. 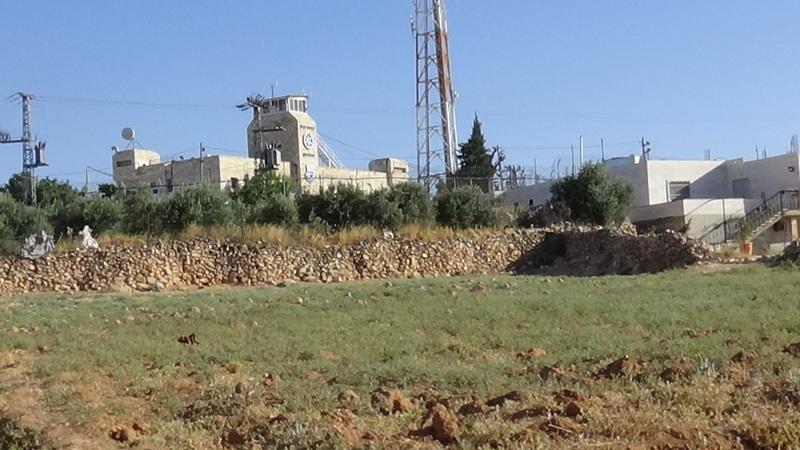 That is what occupation has made of Abu Anan and the Palestinians: gleaners on their own land. The settlers are the lords of the land, the soldiers their sometimes willing, sometimes unwilling henchmen, their fiefdom granted by the civil and military establishment of Israel. The occupation encroaches on more and more of the Palestinians’ life, their place, their fields, until they should feel grateful that they are allowed by these lords to glean from the corners of what was once theirs. This entry was posted in Anti-occupation, Coexistence and tagged Givat Haavot, Hebron, Israel/Palestine, Israeli peace activism, israeli peace movement, Kiryat Arba, Ta'ayush on June 19, 2016 by Jon Simons. Thank you, Jon, for this. I only wish I could have been there yesterday instead of an increasingly right wing racist UK. Thank you for this, Jon. I only wish I could have been there yesterday rather than an increasingly right-wing racist UK. Jon Simons has gracefully woven the pastoral and rather romantic image of gleaners (think of Agnes Varda) and its tie to the recent holiday of Shavuot into his discussion of this activity that took place last weekend by Ta’ayush. 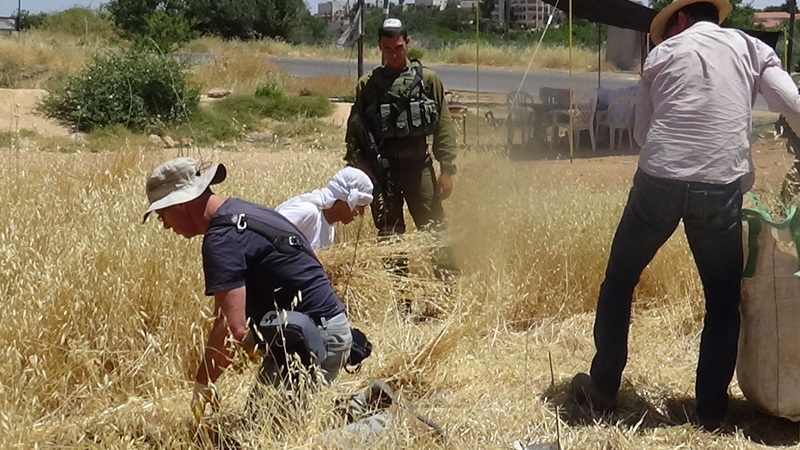 But of course, it was not Shavuot but rather a harvest-time Shabbat and a heartfelt need for settlers to pray on a Palestinian field. Something similar happened last year. My friends whose Ta’ayush activity took them here at harvest time recounted how the settlers prayed under a canopy in the middle of the field where they were working. Soldiers who surrounded the worshippers declared the area off limits to Palestinians. 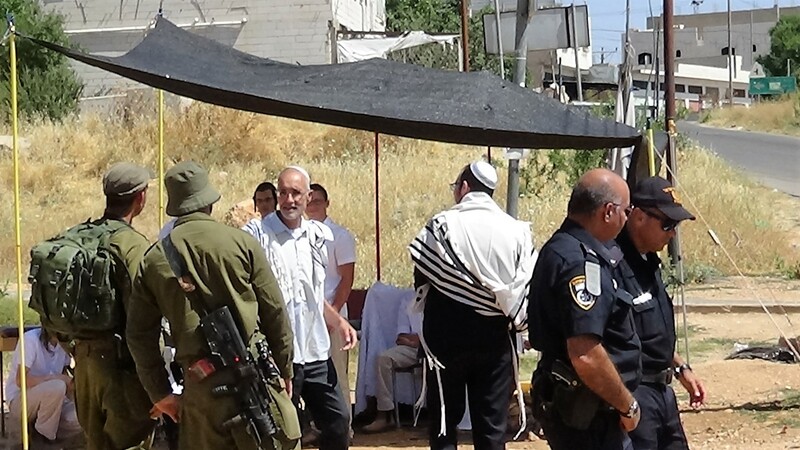 In these routine practices of everyday intimidation settlers, with the cooperation of soldiers, put performative and otherwise visual religious practices – here routine praying on Shabbat, elsewhere the construction of eruv borders, – to use in the service of land expropriation. It is one of the more sobering of common sights. It is also highly photographable. Perhaps next year I will be able to portray this religious practice in photographs. Even better, perhaps next year it will not happen and the lovely vision that he evokes in the end of his essay will have come to pass. I love the metaphor of the Gleaners it is a wonderful way to see into this dreadful expropriation and cruelty that many Palestinians experience in their daily lives.